Hi Helen! Lots of people know you from your work with Lanarkshire Epilepsy Support, but this is a great opportunity to get to know you better. Can you tell us a bit about your background? I was born and brought up Glasgow, and studied Nursery Nursing at Langside College. I’ve always loved looking after children and learned lots about it from my work in nursery care and special care maternity units – but I learned a lot more after I was married and had my daughter, Sarah, and my son, Ross. 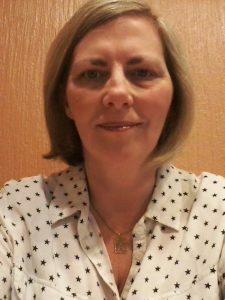 I ran a childcare service from home when my children were young, then began working in the voluntary sector with Epilepsy Scotland and Quarriers, broadening my studies with training on epilepsy and with volunteering. Family is the most important aspect of my life and I’m very happy to have seen my immediate family expand from four to 11, as I now have a son- and daughter-in-law and five grandchildren. Another big part of my life is choral music and I’ve been singing for many years, initially in church performances and more recently with larger international choirs. One of the most interesting events was our choir’s participation in an international performance in 2016 at Carnegie Hall in New York, which included lunch with Donald Trump (pre-presidency). What inspired you to found Lanarkshire Epilepsy Support? The establishment of the charity came out of from my work as an Epilepsy Fieldworker with Quarriers, who had initiated the service, but which ended due to a lack of funding. It was totally against my principles to abandon the service and the people who used it, so with the help of my friend and colleague, Phil Robinson, we began the road to setting up the organisation. The inspiration and dedication to do this I suppose comes from my personal experience of epilepsy and I’m aware that I would never have begun my journey of working in this field or being determined to establish the service in Lanarkshire if I hadn’t had it. We have provided a variety of interesting small projects since we set up the charity but I am so pleased now that we have substantial funding for the next three years and the opportunity to develop into a more secure service. What’s involved in being a Board member? I was a board member at the outset of the charity, but I stood down when I became an employee of the charity. However, I have moved back to being on the board as we now have three new employees. Being a board member means being part of a team that has the opportunity to develop and deliver a service that we all have an interest in. My small part is having personal experience in living with epilepsy and the effects it has on every area of life, as well as being able to provide epilepsy training. We meet regularly and provide support for the staff and continue to search for development and funding opportunities. And finally – what would be your superpower and why? I’d like to be like Benjamin Button (‘The Curious Case of Helen MacDonald’) and start aging backwards to give me more energy to enjoy my busy life – and looking on things as a child does is very often a wise move.